Author & Trainer, Heather Stang. From keynote presentations to conference workshops, Heather will empower and inspire your audience. Conference planners from national and regional organizations share their experiences with hiring Heather for their events. Reach out to Heather to start discussing how she can help you with your next event or workshop. In Fast Paced, High-Stress Environments. Heather works with corporations and non-profits to craft mindfulness themed keynotes & workshops designed to change lives. Based on her experience of a work-stress related diagnosis that led to her discovery of yoga and mindfulness, Heather will inspire your attendees with simple yet powerful tools designed to cultivate leadership excellence while living their best life. Heather is no stranger to high stress environments. She launched her first business in her 20s, sold it in her 30s, then worked on a suicide hotline in honor of her uncle who died by suicide. Somewhere between these two endeavors, Heather was diagnosed with shingles, a stress-related illness, prompting her nurse practitioner to proclaim, “You need to get a grip on your stress. Try yoga.” Little did they know at the time that the practice of yoga would lead to a serious personality change, and a complete overhaul of Heather’s hopes and dreams. 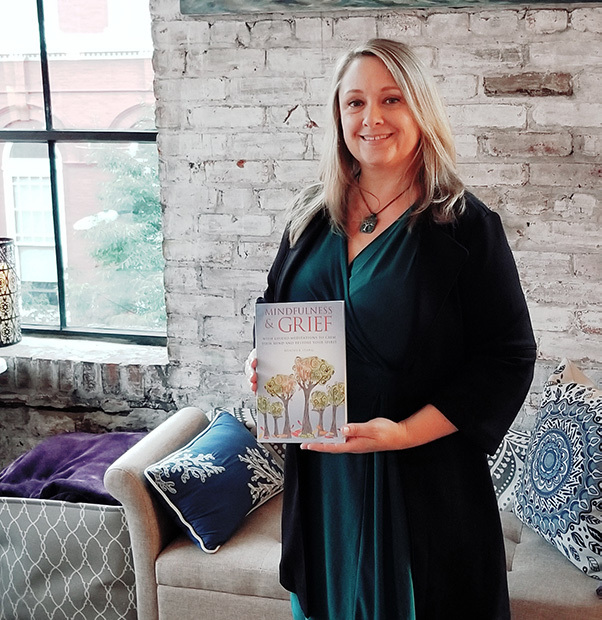 Today, Heather runs the Frederick Meditation Center in the heart of downtown Frederick Maryland, and the Mindfulness & Grief Training Institute. She is the author of Mindfulness & Grief, and hosts a podcast by the same name. She also serves on the Advisory Board to the highly respected military loss organization TAPS, and mentors mindfulness teachers and yoga therapists-in-training. As a mindfulness speaker, she travels around the country teaching mindfulness for leadership, work/life balance, self-care, and personal growth.